Smart Cities in a Digital Nation: Are Swedish Cities Enough Innovative? Sweden is known to be a well-connected society. There is a will to transform the nation into a digital nation with a specific place granted to the smart cities. These smart cities began to map a digital agenda for the next years where e-business, universities, smart transportation, and green and cultural policies have to be combined. 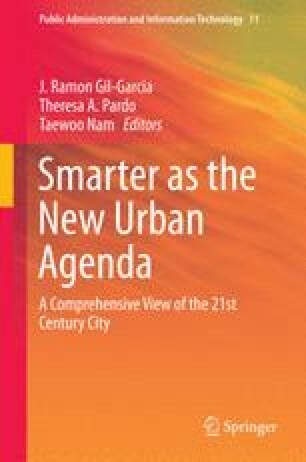 The aim of this chapter is to analyze a few municipal digital agendas (Stockholm, Göteborg, Malmö, Jönköping, Umeå) to describe the Swedish model of smart cities. The question is to know whether the digital agenda is linked to a strong development of smart cities. Congestion tax: Tax for cars and tracks coming in Stockholm. The tax was implemented in Stockholm in 2006. Digidel2013: Campaign launched in the region of Umeå to strengthen the internet connections of the inhabitants in Västerbotten. Digitization committee: The committee’s tasks were defined in the directive of the 7th of June 2012. The committee has to make recommendations on the digital agenda by the end of December 2015. According to the directive, the committee has to publish annual reports (Statens offentliga utredningar, SOU 2013, p. 31). It defined 22 fields where digital policies could be measured. High-Performance Computing Center: This is a cooperation between universities with a special work on virtual reality and scientific visualization in Umeå. The use of high-performance computing includes compute-intensive and communication-intensive applications. Metropolitan effect: The cities that absorb surrounding communes. The metropolitan areas need a clear governance and a territorial plan to think about better public policies connected to the social needs of citizens. Open data: The data and statistics that are available for citizens. Some Swedish municipalities chose to publish statistics on the local population. Post-materialistic attitudes: are the values that highlight a care for environmental issues, individual autonomy rather than beliefs in job and growth. These attitudes privilege team work rather than hierarchy. Global Mobile Data Traffic. (2015). Cisco Visual Networking Index: Global Mobile Data Traffic Forecast Update, 2014–2019. http://www.cisco.com/c/en/us/solutions/collateral/service-provider/visual-networking-index-vni/white_paper_c11-520862.html. Mishra, M. K. (2013). Role of technology in SMART governance: ‘Smart city, safe city’.. http://ssrn.com/abstract=2310465 Accessed 15 Aug 2013.